We have had a GREAT summer at the Visitor Centre! We had the pleasure of hiring four truly wonderful summer students. Brianne was born and raised in Kamloops. She is studying languages at the University of BC and the fact that she spoke fluent French was truly appreciated by some of our French speaking guests. Jamie is a fourth year Tourism Management student at TRU. Her dream is to work in sport event management. She was a tremendous help in organizing our participation at RibFest. Janna is studying Natural Resource Science at TRU. She has a keen interest in eco-friendly tourism, speaks fluent French and has a vast knowledge of BC. Michelle is currently in her third year of Tourism Management at TRU, she has a wonderful knowledge of adventure tourism in the Kamloops area, especially fishing, hiking and biking. Throughout the summer we received numerous accolades with respect to the quality of service provided to our guests by our summer students. 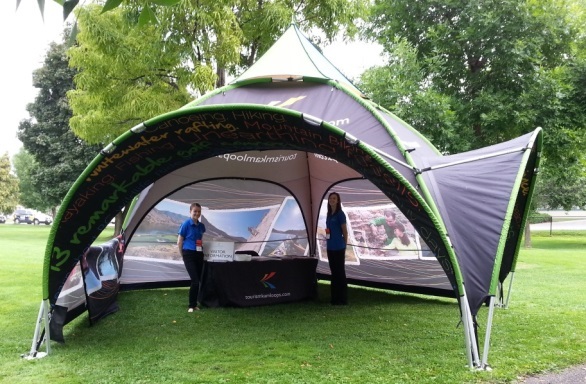 We provided Kamloops tourism information at RibFest and Overlanders Day. We conducted surveys for a Tourism Kamloops led initiative, with support from the Kamloops Bike Riders Association, to conduct visitor surveys at the Bike Ranch, Pineview Valley, and Kenna Cartwright bike trails, as part of a mountain bike tourism economic impact study for the Kamloops region. We interviewed over 300 travellers at the Kamloops airport as part of an on-going research project sponsored by the Kamloops Airport and Tourism Kamloops. We prepared over 6750 welcome kits for visitors attending conferences and tournaments. We participated in the Freshwater Fisheries Society of BC’s Free Rod Loan program, so that we could loan our guests free fishing rods and tackle. A much appreciated program indeed! We participated in the BC Parks Passport to Parks and Visitor Centres program. And the best news of all…drum roll please! We have seen an increase in visits to the Visitor Centre by 10% year-to-date over 2014. We love it! We have especially seen an increase in visitors from the United States and Asia/Australia markets. The type of inquiries that we receive the most, are for maps and directions and adventure tourism, especially hiking and biking. Our office is at its busiest between 9:00am and 4:30pm in the summer months. To ensure that the Kamloops Visitor Centre is taking advantage of available programs and opportunities, Monica and myself will be attending the Visitor Centre Network Conference in October. This annual conference affords key learning opportunities and provides a venue for collaboration with other Visitor Centres across the province.